For the most part THE TEN ISLANDS is an instrumental album, but like all good instrumental albums, it includes a handful of songs as well. Joking apart, the songs included on this album do serve to complement the instrumental pieces remarkably well, all three traditional songs beautifully sung by Canadian singer Lisa Winn; The Banks o' Doon, Kelvingrove and Smile in Your Sleep. The German born musicians Jochen Roß and Jens-Uwe Popp have taken the landscape of Scotland as inspiration for this collection of pieces and have created an album of melodies that successfully reflect the essence of Scottish music but at the same time maintain the integrity of an international collaborative ensemble. Taking some of Nigel Gatherer's compositions as a framework to build on, the collection of songs and tunes are held together by Jochen's mandolin and Jens-Uwe's guitar, with additional contributions from a wealth of international musicians including double bassist Guido Jäger, Moroccan percussionist Rhani Krija, guitarist Fabian Hink and on didgeridoo, Ulrich Schubert. I hesitate to say that this album often sounds like a film soundtrack, particularly the sprawling East Parkside, which provides a theme of almost cinematic proportions, highlighted by the fact that it pops up again as a reprise at the end of the album. However, I can't help but imagine this music being used specifically to add atmosphere to a good intelligent movie. 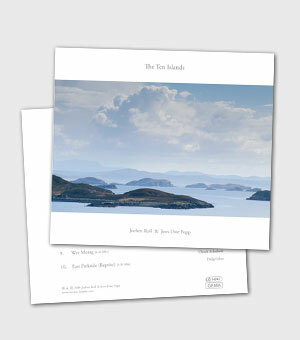 With the additional sounds of the elements, the odd cigarette being lit or a party in full swing, THE TEN ISLANDS pretty much holds itself together as a suite of predominantly acoustic compositions, inextricably linked by a high standard of musicianship and the occasional electric guitar reminiscent of Mike Oldfield's early work.